Digging deep Corporate Liability. Environmental Justice strategies in the world of oil. 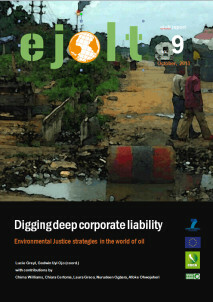 Ejolt report 9: Digging deep corporate liability. Environmental Justice strategies in the world of oil. The low resolution report can be downloaded here. The high resolution report can be downloaded here. The impacts provoked by the expanding oil industry encompass environmental destruction, health impacts and violations of human rights. The increasing contamination jeopardizes safe conditions of life and destroys means of livelihood of vulnerable communities and of those relying on healthy ecosystems. Local communities, feeling that they are simply sacrificed to the oil industry, see themselves involved in social conflict. They are experiencing forms of environmental discrimination and might even face criminalisation of the protest when they stand up to defend their rights promoting the chilly effect on others who need and want to defend themselves and the environment. In fact, the number of lawsuits demanding justice for environmental, social, economical and cultural damages provoked by oil companies are increasing as well as their media visibility. Yet most outcomes are not satisfactory in tackling impacted communities claims for justice. This paper describes the most recent trends regarding oil corporations’ responsibilities and use of procedural justice by civil society through the review of emblematic legal cases. Keywords: corporate accountability, corporate social responsibility, economic valuation, environmental crime, environmental justice, environmental liabilities, oil frontier, procedural justice. Authors: Lucie Greyl (CDCA) and Godwin Uyi Ojo (ERA/FoEN) with contributions by Chima Williams (ERA/FoEN), Chiara Certoma (CDCA), Laura Greco (CDCA), Nurudeen Ogbaraame (ERA/FoEN), Afoke Ohwojeheri (ERA/FoEN). Policy recommendations are in the EJOLT briefing linked to this report.